I am going to try something new and try to post more deals on smaller items that may not necessarily be tools, but might be tool accessories or jobsite related items. Hot deals on power tools are great, but it is also nice to score on some smaller items. 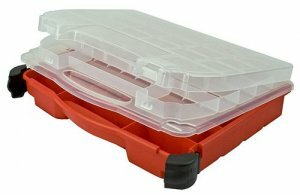 For our first go we have a Plano 5231 Double Cover Stow N Go Organizer that is regularly priced at $15+ for the low price of $9.99. Plano is one of the go to brands small parts organizers and this particular models looks like it would be great for really small items like Dremel bits and attachments. To get an idea on size take a look at some of the customer images on Amazon to see how people are use this organizer.